Wouldn’t it be fun to look back in ten years of your little ones cradling their beloved pet? Or look up at your walls to see your furry family member smiling down at you? Pets aren’t relegated to just dogs and cats! Do you have pocket pets? 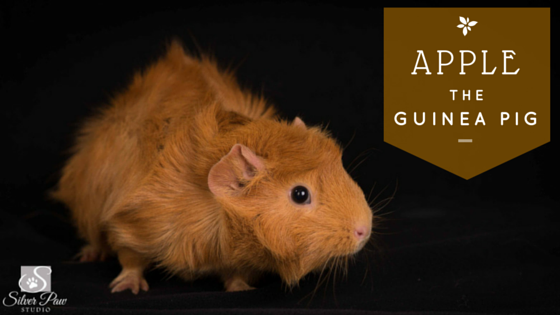 Guinea pigs, mice, rats, and gerbils are very common animal companions. These furry critters deserve their moment of fame too! We can schedule a session highlighting your pet and your pet with you or your children. In grade school I had a black gerbil who loved to nibble at the world map hanging on the wall behind her cage. One time she bit me and I dropped her. Poor thing suffered a bloody nose and I worried all day that I had caused some kind of brain damage. We played very carefully after that. As a teenager I had a pair of mice named Cecil & Beany. A friend named them after a cartoon show I had never seen but the names stayed anyway. I never had guinea pigs but loved hearing their little squeals whenever I visited one. Big, little, wavy hair, black & white, and red. These little guys sport quite a variety of looks. Apple is the name of this little girl. She a seven month old Abyssinian guinea pig. Baby carrots kept her happy while I snapped away. After a few minutes her mom suggested using the toy piano I have for visiting kids. Apple stole the spotlight and should have a promising career on broadway! She even flashed her biggest gpig smile. So cute right? Do you have a pocket pet? Or a bird? How about a reptile? Professional portraits of your pocket or exotic pets can be a keepsake and a stunning art piece. Call me for a session on your location or at my home studio.